Pompeii was absolutely shocking to me. Throughout the extent of my visit, I continuously found myself considering how enjoyable the city must have been during its prime. It was a get-a-way where hard working tradespeople would escape in their free time. 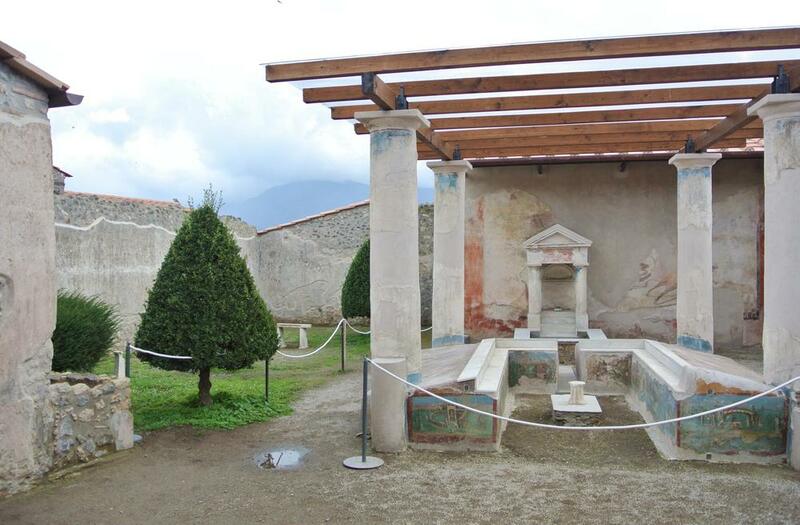 There is a highly provocative sense of community in Pompeii. Each villa is an ideal, self-contained schema that converses with the public at a commercial level. But these villas simultaneously behave as a single fabric that is interrupted by pockets of perfect public spaces.There are rooms dedicated to lounging while eating laying down. There are pleasure baths and theaters. There are athletic facilities for games and exercise. Below: The street engineering fascinated me - they have large stones that act as sidewalks so that the streets could be flooded for cleaning. The right image shows the grinded gully created by the wagon wheels. Above: Each villa had a front space for vendors, similar to our current urban work/live typology where commercial program occupies the ground floor. The counters would be filled with those large pots which contained a variety of products/food. Each villa was designed with a very deliberate focus on creating a desirable living condition. In the states we are all about exploiting our allotted site in terms of "bang for your buck." We measure buildings as square footage and push our limits to obtain more "space." But that space becomes less ideal when the driving force of its design is generalized for getting more space. In Italy, especially, buildings are constructed with living as the driving force. Outdoor courtyards are not "wasted space" but rather the heart of each home, offering accessibility to the elements and natural lighting to each room. In Italy, buildings are measured in cubic meters, which exemplifies how they view occupiable space as a condition of volume versus ground space and number of floors.